Cleanliness and usability are critical when designing equipment for hospital rooms. 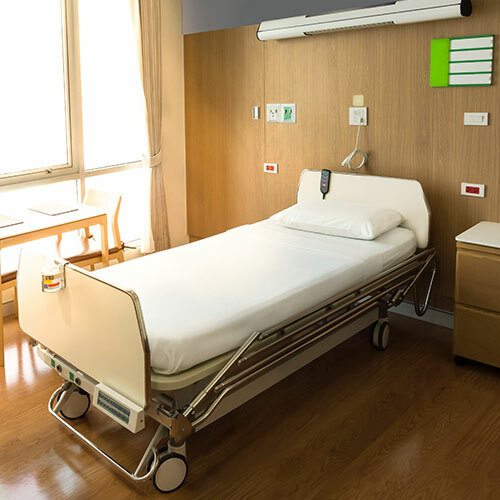 Polymer Technologies, Inc. (PTI) was approached by a design and engineering services company to assist in redesigning the acoustical treatment package used in a hospital bed mattress inflator. The current blower produced too much noise during operation and disturbed resting patients when repositioning the mattress. Our team was up to the challenge and tackled the inflator’s noise management problem. We examined the current design to understand how its functionally could be improved. The design of the hospital bed inflator consisted of a blower encased in a plastic housing. The housing was comprised of two injection molded halves that, when joined, could attach to the bed frame. The blower was installed in the housing by adhering it a molded plastic mount. To absorb noise, the molded plastic housing contained ten die cut pieces of acoustic foam inside. Eight of the ten pieces were assembled together to create an air inlet path to the blower, while the remaining pieces were installed above and below the blower with pressure sensitive adhesive (PSA). To cut all of the unique pieces of foam, three separate dies were required to fabricate the parts. In all, the devices consisted of thirteen pieces, not counting the blower or electronics. All of these pieces took time and effort to apply, making assembly time-consuming. Despite all the labor and cost that went into producing the original acoustical solution, the inflator was not operating as desired due to excess noise. To get a baseline of how much noise was being produced, we tested the device as-is in our acoustical testing chamber to measure the sound levels. We discovered that the inlet of the device was over 56 dBA with several significant spikes in the frequency spectrum, making it difficult to move patients without disturbing them and others in the room with the inflator in operation. There also appeared to be a fundamental frequency of 315 Hz with additional spikes present at the 1st and 2nd harmonics (630 Hz and 1,250 Hz). Using these specifications as a reference point, we developed a noise absorbing solution for the medical manufacturer that met their needs. With both the range of noise and the time-intensive assembly process as reference points, our team was able to redesign the inflator acoustical treatment package. Using our in-house Polymer Molded Product Division (PMP), we developed a two-piece POLYFORM® molded foam insert set that totally encapsulated the blower. The newly designed device was put into production by the Design and Engineering Service company’s customer after demonstrating the benefits of using engineered POLYFORM® molded foam inserts. Our molded foam inserts provided a reduction of the overall noise level by 5 dBA. They also greatly reduced the 1st and 2nd harmonic spikes that were evident in the as-received condition, which resulted in a more acceptable sound quality. Having fewer foam inserts also enabled the manufacturer to improve assembly time and cost. Due to the success of this project, Polymer's molded foam inserts are now a standard product used in their hospital bed mattress inflator. This is another example of success using the all-in-one acoustical, vibration isolation, and packaging solution provided by Polymer's custom engineered POLYFORM® molded foam inserts. When designers consider molded foam products at the onset of a project, OEMs can design simplified assembly processes that increase noise reduction, improve assembly time, and reduce the number of parts required. From developing insulation for medical pumps and motors to creating engine compartments, molded foam is suitable for use in a variety of mid to high volume manufacturing processes. If the possibilities of a molded solution excite you, then be bold and develop your own custom mold with us, the experts at PTI.